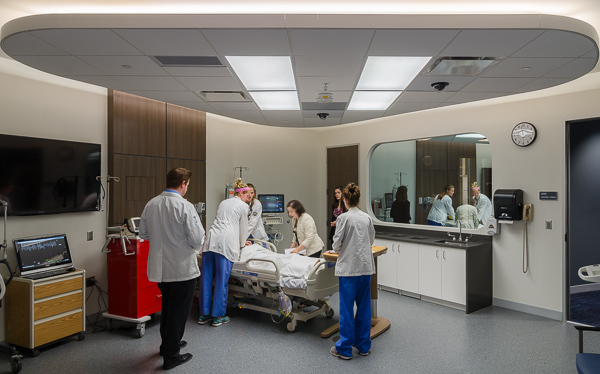 The University of Toledo Interprofessional Immersive Simulation Center (IISC) | JDRM Engineering, Inc. 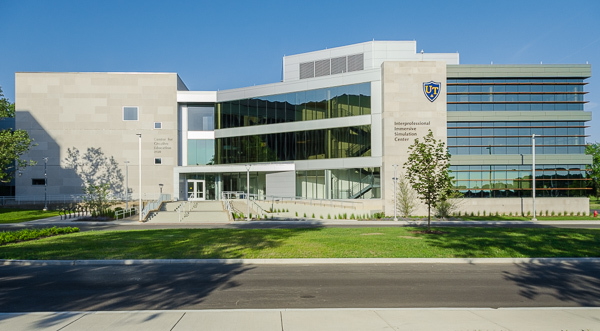 Through this facility The University of Toledo provides state, national and global leadership as it transforms how health care professionals are educated. The IISC drives innovation in learning, clinical practice and research through a creative learning environment that incorporates advanced simulation models and virtual immersive technology. The IISC is a venue for health care professionals to establish multidisciplinary partnerships to advance health care education and practice while developing new processes, procedures and technologies. The 3D immersive technology includes a five-sided CAD cave (the only one of its kind in the world) plus two additional curved CAD walls to train teams to function in low-risk, yet highly realistic environments. 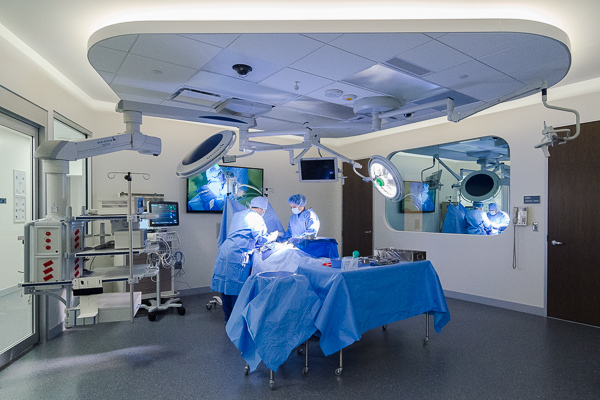 This facility is an outstanding example of public/private partnerships where researchers employ the most advanced technologies to improve patient outcomes, reduce errors and enhance efficiency — thus lowering health care costs. JDRM Engineering provided Mechanical and Electrical engineering services, supporting the needs of emerging project requirements as the project unfolded. The building’s systems are designed to reduce energy consumption by exceeding the ASHRAE 90.1-2007 requirements while complying with the mechanical code and the facility is certified LEED Gold. The IISC incorporated a former exterior wall of an existing facility into the main lobby, required the partial renovation of an existing building and adds an entirely new structure into its realm. Designed to exceed standard requirements, the Center is ventilated by an indoor variable volume air handling unit and a constant volume air handling unit which are connected to the college campus’ heating and cooling plants. The supply air to the building is provided by a custom indoor air handling unit. The unit consists of a supply fan wall configuration, return fan wall, hot water heating coil, chilled water cooling coil (capable of low temperature supply air), high efficiency filters, sound attenuator, steam humidifier, outside air, return air, and exhaust air dampers. The unit operates continuously and the outside airflow quantity is monitored by an air flow measuring device. The supply air is distributed to the space via constant volume reheat boxes and variable air volume reheat boxes. The hot water heating system consists of variable speed building distribution pumps and a hot water to steam heat exchanger. The steam is generated from the existing campus steam plant. 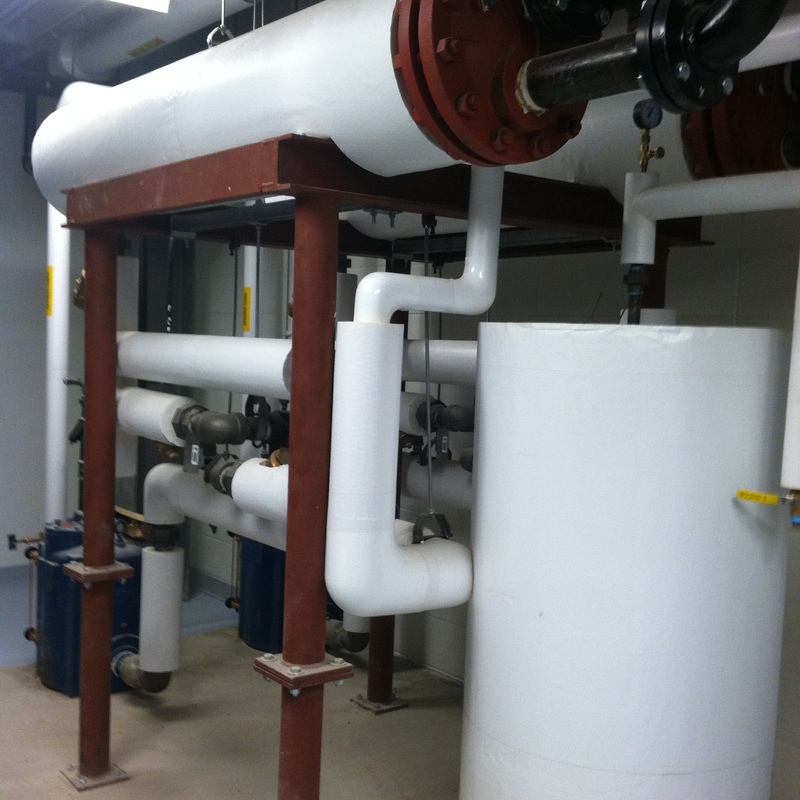 Chilled water is generated from the existing campus chilled water plant. New pumps replaced existing distribution pumps and will have capacity to serve this project as well as two other buildings on the campus. Variable speed pumping control save operational energy consumption. The DDC control system is an extension of the existing and monitors all space temperatures as well as HVAC equipment operation and energy consumption. The power electrical distribution system is a double ended 1600 amp substation with a pair of 1000KVA transformers to match the campus standard. Space limitation within the building required the transformers and switchgear be mounted in the penthouse. The system is tied into the University’s existing 15KV loop. New systems were designed for power distribution, lighting, fire alarm, and mass notification. JDRM coordinated needs from the AV and technology consultants and simulation lab manufacturer for implementation of the 3D and holographic simulation labs. Lighting, power, and fire alarm needs were designed for 3D and holographic simulation labs per manufacturer requirements. The electrical design services included the implementation of a 15kV loop. The 15kV loop was extended from the existing CCE building and includes a double ended switchgear arrangement as well as a 200KVA generator located in the building penthouse. LED lighting is featured throughout the Center which is LEED gold certified. 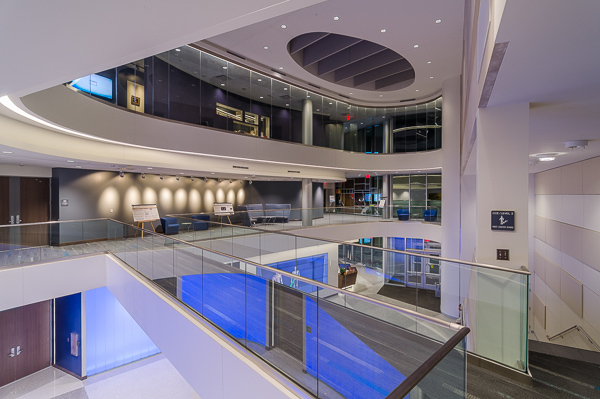 Most of the lighting systems work with an automated Crestron system for control, and automatic shutoff is accomplished per Energy code requirements. The fire alarm/mass notification system is integrated into a dedicated campus fiber loop which is constantly monitored by campus police.